Since the beginning of EstateGuru, already 367 projects with a total sum of €60 094 383 have been funded on the platform. All these projects have been done in 5 countries: Estonia, Latvia, Lithuania, Finland and Spain. 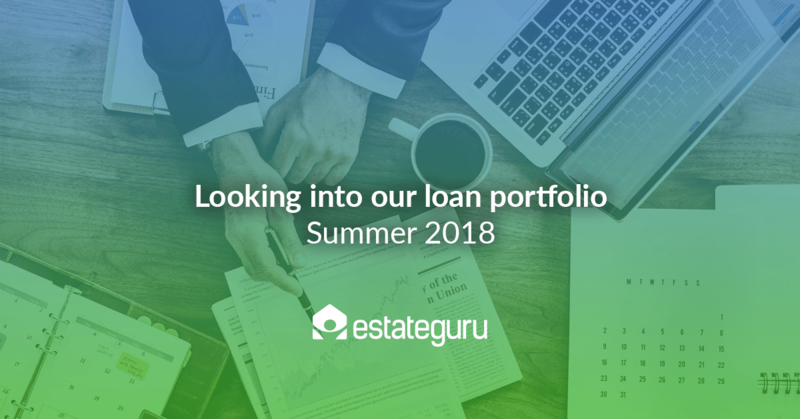 In the following blog article, we give an overview of the EstateGuru loan portfolio in a short and informative analysis. The EstateGuru loan portfolio is mostly divided into 3 types of loans: bridge loans, development loans and business loans. Bridge loans are defined as short-term real estate loans that provide the property owner the necessary capital until a permanent solution for financing has become available. A development loan is used to develop the property, that ranges from construction works to excavation works, i.e. development of area infrastructure, including utilities and roads. A business loan is a mortgage loan that is used to finance the capital needs of a company’s expansion, secured with a collateral that the company owns. Since EstateGuru started its journey in Estonia and only later expanded to other countries, it might not come as a surprise that the highest amount of loans had been funded in Estonia. The country is currently enjoying an economic boom, which ensures that a lot of property developers are using the opportunity to get financing on good terms. 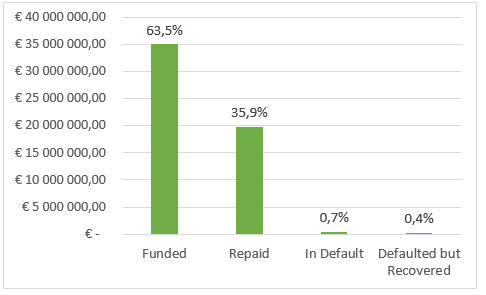 77% of EstateGuru’s whole loan portfolio has been done in Estonia, with Lithuania trailing at 11% and Latvia coming third at 9%. In 2018, EstateGuru also expanded to Finland and Spain, with the first projects on both respective markets already funded. 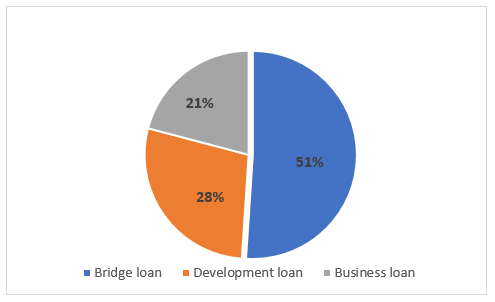 Furthermore, we bring out a graph detailing the loan portfolio by loan status. Graph 3. Loan portfolio by loan status (%). Already 148 loans of 367 have been repaid on the EstateGuru platform as of today with a total principal returned amount of €23.7 million. This makes up about 36% of the whole portfolio. 2 loans with a combined sum of €360 000 are currently listed as “defaulted” with the sales processes of the collaterals ongoing. 1 defaulted project was recovered and investors gained a 13,72% return from this project. All of the projects on the EstateGuru platform are backed by a collateral. This ensures that in case a borrower is not able to repay his loan, then EstateGuru is able to take steps to make sure that the investors still receive their money. The main security against this is ensuring that the loan has a 1st or 2nd rank mortgage attached to it. Graph 4. EstateGuru loan portfolio security types (%). 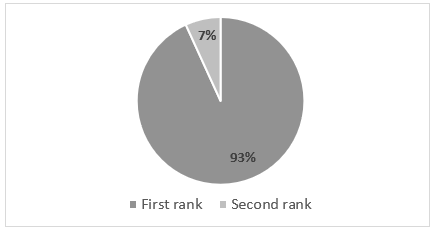 As seen on the graph, a majority of the projects on EstateGuru are secured with a 1st rank mortgage as only 7% of the whole portfolio is secured with a 2nd rank mortgage. This means that in most cases, EstateGuru has all the rights to the underlying collateral. Furthermore, all of the collaterals are either commercial real estate, residential real estate or land, which leaves the liquidity of the collaterals at a high level. This can be proved further on the following graph. Graph 5. EstateGuru loan portfolio collateral types (%). 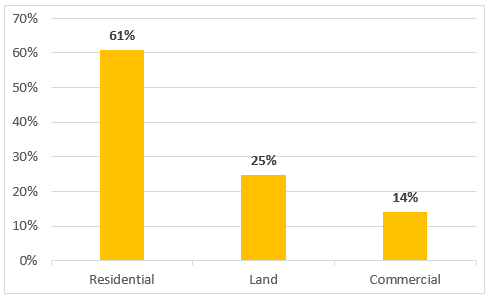 61% of the projects on the platform are secured by residential real estate – be it a private house or apartments. A quarter of all loans are secured by a land plot and 14% are secured by commercial real estate like office spaces or a warehouse. The general consensus in the 3 Baltic countries is that the biggest developments happen inside and around the capital cities. With more and more of the population moving closer to the biggest cities, real estate developers get an opportunity to provide them homes and office spaces. This pattern can also be seen with EstateGuru’s loan portfolio. First of all, we bring out the project allocations by region in Estonia. Graph 6. 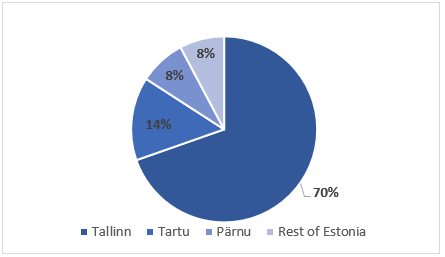 Projects allocation in Estonia (%). Almost ¾ of projects in Estonia have been done in Tallinn and around it. The next biggest cities of Estonia, Tartu and Pärnu, follow with 14% and 8% respectively. The rest of Estonia has a 8% share of the total funded portfolio in Estonia. In Latvian real estate, the same can be noticed – Riga takes a 82% share of the total, with Jurmala following at 13%. The rest of Latvia has a small share of the total portfolio in Latvia. Graph 7. Projects allocation in Latvia (%). 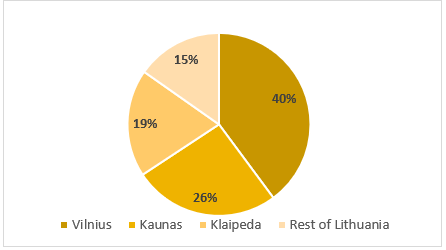 In Lithuanian real estate, the allocation is more diverse and Vilnius is closely followed by Kaunas, which has about a quarter of the whole portfolio. The Kaunas area is quickly developing in Lithuania and the market is expanding rapidly. EstateGuru has also done a fair share of projects in Klaipeda and the rest of Lithuania. Graph 8. 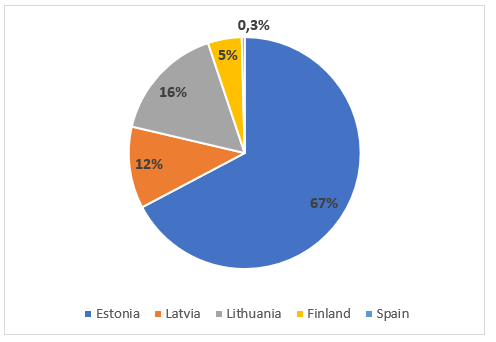 Projects allocation in Lithuania (%). In conclusion, EstateGuru’s loan portfolio is already over €60 million and growing every day. The average return for investors today is 12.32%. In 2018 we are looking to open up even more investing opportunities for our investors by expanding into new countries and increasing the number of projects in the Baltics as well.